I love working with clients and hearing their ideas so that I can create unique designs that communicate their theme most effectively. The options are endless – theme, sizes, paper stocks and finishings (see below). If your budget is tight, please be aware that the bespoke option is costly and the Standard Range option may be for you. Please note: These stationery jobs take about 1.5 months to turn around (design and print). Rush orders can be put through but this may effect your cost. There are various different print finishes available to choose from. 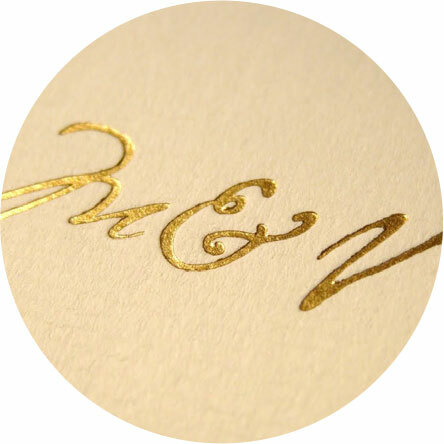 Consider some of the following when ordering your bespoke stationery. If you would like a quote for bespoke stationery please fill in the form below. Please note: Changes to the below information beyond the quote stage of the job will effect the price. Please provide the following information: A description outlining your ideas so that I can accurately gauge the work involved, a list of items that you require, sizes of each item, paper stock (Uncoated, Silk or Gloss), finishings (see examples above) and quantities of each item. REMEMBER – you will not need one invite per person as you will have couples and family groups to invite. If you are not getting a quote for invites please write 'non applicable'.